Put the water, lime juice, and cayenne in a casserole dish and add skewers. Add the tomatoes, peppers, and onion to a large bowl. Add the olive oil and herbes de Provence - mix well so that all the vegetables are coated. Place the vegetables on a heavy baking sheet without overcrowding. Put into the oven until the vegetables are tender and charred areas appear on the skins. About 10 to 20 minutes. Watch carefully! Meanwhile add the remaining olive oil to a heavy skillet with 1 tablespoon of butter. Heat it up and add the garlic and celery. Taste and adjust seasoning. Add sugar if needed. Set aside in a warm spot. Peel and devein shrimp. Remove skewers from water. Add about 4 shrimp to each skewer, making sure there is space between each. Sprinkle with Tony Chachere's seasoning - more if you like spicy and less if you like it less spicy. Grill about 2 to 3 minutes on each side. 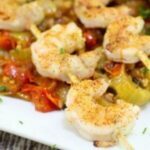 Serve the skewers over the roasted Creole sauce.